Who Was David? continues the Kingdom Files series by Matt Koceich. Written by an elementary school teacher, the entire series is targeted for kids ages 8 to 12. Grayscale pictures are present throughout the chapters (David looks really young when he fights Goliath). The first portion of Who Was David? is the “Fact File” – two pages that provide basic information about the character such as name, occupation, approximate time of life, etc. 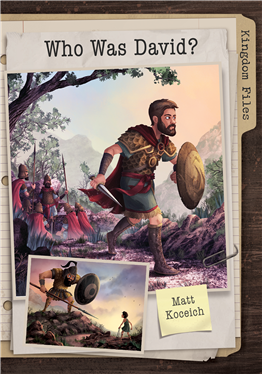 The “Action File” is the longest section and retells the story of David, a brave youth who became king of Israel. The text aligns with the Biblical narrative, but does not include everything. The majority of this section was concentrated on David's ascent to the throne. His battle with Goliath is mentioned as are the situations by which he married his first two wives. Absalom's troublemaking occupies a few pages, but David's affair with Bathsheba is not mentioned, only that she was Solomon's mother. The last chapter of the “Action File” focuses on brief explanation and instruction of a handful of David's Psalms. The chapter is best experienced with a Bible open to the Psalms to read each chapter and then the corresponding paragraph in Who Was David? The “Power File” offers ten short devotions based off the story and accompanied by a Bible verse. These are appropriate for both genders and suited to the targeted age range. On the surface, these seem like simple thoughts, but they are based on deep truths that can uphold one's faith in God. In conclusion, Who Was David? by Matt Koceich teaches the story of David as it entertains and instructs.